Nasukawa: I Will Take Down Mayweather, Look Forward To It! 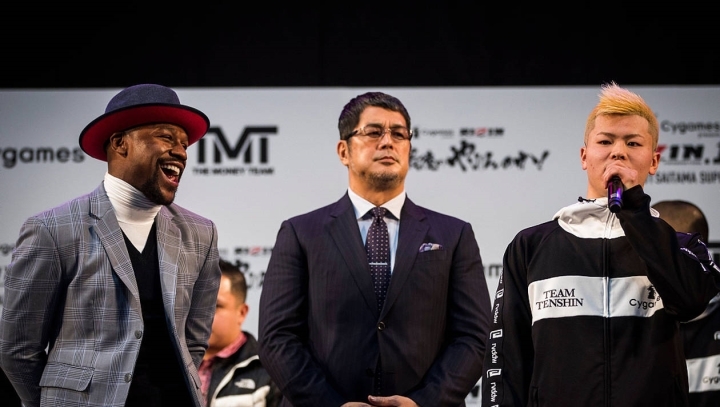 Five division world champion Floyd Mayweather Jr. was smiling on stage as he went face to face with Japanese kickboxing sensation Tenshin Nasukawa, during a ceremony at Saitama Super Arena in Saitama, north of Tokyo on Sunday. Mayweather is scheduled to fight in a three-round exhibition match in Japan on New Year’s Eve. Nasukawa has promised that he’s going to come out guns blazing, looking for a knockout victory. “People in Japan, listen. I will take down Mayweather. You should look forward to it,” Nasukawa said. According to reports in Japan, Mayweather will earn as much as $20 million for the exhibition, which Mayweather does not seem worried about. He expects to easily outbox the young fighter, who has never competed in a bout with traditional boxing rules. “It’s just another day. Another day like I wake up, take shower, put my clothes on,” Mayweather said. Mayweather announced his retirement from the sport of boxing in August 2017, after securing a tenth round stoppage of UFC superstar Conor McGregor at the T-Mobile Arena in Las Vegas.